The historic homeland of the Kalispel Indian tribe, Sandpoint began to experience white settlement when fur trappers built a trading post on the Hope peninsula in 1809. Succeeding eras brought mining, steamboats and then construction of railroads in the 1880s. Sandpoint was incorporated in 1901 and grew as a logging town; in the 1940s a trophy trout fishery in Lake Pend Oreille brought renown, and founding of the Schweitzer ski area in 1963 propelled the town into a four-season recreation destination. Sandpoint is now a vibrant community, rich in arts and culture. The population of the city is 7,365 (2010 census). As the county seat, Sandpoint also services much of Bonner County, population 40,877 (2010 census). A wide range of people make up the Sandpoint community; many are native residents  30 percent were born in Idaho  but most were born elsewhere, relocating after experiencing Sandpoint’s friendly atmosphere and beautiful setting. - Read a profile of Sandpoint. - Go to Sandpoint Online, the community’s oldest and largest portal site. Surrounded by heavily forested mountains and nestled on the shore of the state’s largest lake, Sandpoint is known for its exceptional natural beauty. The town itself is attractive with many buildings of architectural distinction, several nice parks including City Beach and bustling events that reflect the vigor of the community. View a slide show of Sandpoint. 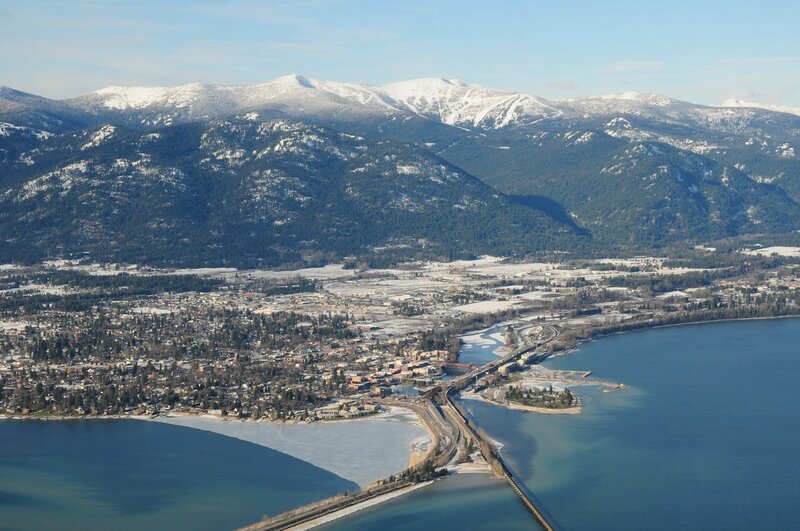 The Sandpoint area is rich in natural resources and outdoor recreation opportunities. About 40 percent of northern Idaho is National Forest land, along with 65 percent of the shoreline of Lake Pend Oreille. As a result, camping, hiking, biking and other outdoor activities are popular in the area. The weather in Sandpoint changes dramatically throughout the year, creating four distinct seasons. Summer temperatures, such as in July, reach average highs in the 80s and lows in the 40s. On occasion, the mercury spikes to 100, making it an ideal time to take advantage of the lake. Fall is a popular time for camping and sports activities; temperatures are cooler with long Indian summers, and the autumn leaves and beautiful weather make it the preferred season for many residents. Winter in Sandpoint revolves largely around Schweitzer Mountain Resort, which boasts an average annual snowfall of 300 inches. Winter temperatures, in January for example, average 26.3 degrees. The spring thaw brings warm weather and rushing creeks, making it a popular time for sports such as hiking and whitewater rafting. The rapid weather shift also offers the unique chance to ski in the morning in the mountains and golf in the valleys in the afternoon. - See the current weather forecast. - See historical weather data. The City of Sandpoint is governed by a mayor and six city council members. Together they manage the city’s general operations, control the budget and oversee public safety, the planning department, and parks and recreation. Bonner County has three commissioners who oversee the courts, elections, assessor’s office, county roads, planning and the sheriff’s office. Lake Pend Oreille School District comprises Sandpoint High School  the largest of three high schools in the district  Clark Fork Junior/Senior High School, Lake Pend Oreille High School, Sandpoint Middle School and seven area elementary schools. Sandpoint High School serves around 1,400 students and is a focal point for the community, hosting sporting events, concerts and plays. In return, the Sandpoint community provides strong support for the education system through supplemental levies, private sponsors, scholarships and community support. The Sandpoint area is also served by the Forrest M. Bird Charter Schools, serving students in grades 7-12. Several private schools are also available, including: Sandpoint Waldorf School, serving preschool through 8th grade students; the Sandpoint Junior Academy, serving grades 1-10; the Sandpoint Community Christian School, serving grades K-10; and The Selkirk School, serving grades preschool-2. As for higher education, North Idaho College is a comprehensive community college based in Coeur d’Alene, located 45 miles south of Sandpoint, that also has an outreach facility here, the NIC Sandpoint Center. The University of Idaho also maintains a Sandpoint Research & Extension Center, with research and extension activities conducted in Sandpoint. Sandpoint is blessed with an excellent library that has one of the highest per-capita circulation rates in the state, the East Bonner County Library. The main branch is right here in Sandpoint, located at 1407 Cedar Street, with a satellite branch in Clark Fork at 601 Main Street, and the Bookmobile, which stops at seven locations over the course of each week. Renovated, expanded and improved in the past few years, the West Bonner Library District is the only other public library in Bonner County. It is located in downtown Priest River at 219 Main Street, and can be reached at 208-448-2207. Sandpoint is home to a whopping number of community-based nonprofit organizations - several hundred across the spectrum of interests, from advocacy to the arts to youth and professional groups. Find listings for nonprofit groups in the Sandpoint Online directory pages for Community Groups & Social Services. One excellent resource to connect up with social aid organizations is the Sandpoint Community Resource Center, which offers some 350 resources for those in need, as well as tools to volunteer to help via the Volunteer Idaho Panhandle pages. The area has numerous churches and religious organizations, with more than 30 in Sandpoint alone. Churches are located throughout the area and provide a wide range of options for spiritual enrichment. Find a church in the area. For a small town, there’s a lot going on in Sandpoint. The area has one daily paper (published six days a week), the Bonner County Daily Bee, along with a number of regular publications and periodicals, including the weekly Sandpoint Reader, published each Thursday, and Sandpoint Magazine, our town's biannual color glossy magazine published each May and November. Blue Sky Broadcasting operates three radio stations in Sandpoint, KPND 95.3 FM, K102 FM and KSPT 1400 AM, featuring local news and talk shows, plus there's KRFY Community Radio at 88.5 FM, with a live stream button on their web page to click and listen right now. In addition, Sandpoint Online has an overview of local news and publishes the Town Crier, a weekly email newsletter that keeps readers in touch with area news and events. Subscribe to the Town Crier. Bonner County is home to some beautiful stretches of highways and roads, including the Pend Oreille National Scenic Byway, a 33.4-mile stretch on Highway 200. For those planning a trip to Sandpoint or interested in getting around the area, there are a number of transportation options available by bus, plane, train or automobile. Go to the Travel Center for more information on area transportation and up-to-date road reports. The Sandpoint area labor market, once dominated by the mining and lumber industries, has now diversified and is home to large employers in several business sectors, including a growing number of manufacturers. The steady pace of construction and the real estate industry is also contributing to an increasing employment base. Though relatively smaller than it once was, the lumber industry is still a large employer in the area. Litehouse, the salad dressing and specialty foods manufacturer, is one of the largest private employers in the county. Unlike most other parts of the nation, manufacturing companies here continue to develop and add jobs, contributing to a doubling in manufacturing jobs, from 1,171 in 1996 to 2,389 in 2013. They include Quest Aircraft, Unicep Packaging, Cygnus, Diedrich Manufacturing, Encoder Products and Kochava mobile app maker. The Lake Pend Oreille School District is the largest public employer in the county. To learn more and find links to the latest on the job market and employment trends, visit our Job Center. To learn more about doing business in and around Sandpoint, click here. The organizations provide answers to some of the more commonly asked questions about doing business in the area and link to more extensive information. Visit our Super Directory to search more than 300 listings for businesses, community groups, clubs, churches and more in the Sandpoint area. Browse Sandpoint Magazine archives of more than 200 stories about our town. Also, be sure to click deeper into this website, as SandpointOnline is a remarkable resource. The information is organized in the 10 major sections that have buttons in the orange navigation bar at the top of each page; secondary pages are in the subsidiary blue bar that appears on each section page. Sandpoint is home to an extensive network of artists, galleries and arts organizations. With several art galleries downtown and everything from the Panida Theater to the Festival at Sandpoint, the arts community is one of Sandpoint’s greatest resources. Learn more about the arts in Sandpoint. From the mountains to the lake, the Sandpoint community takes recreation very seriously. Check out the Recreation section for information on Lake Pend Oreille, golfing, biking, campgrounds, snow sports and more. A hot spot for tourists and vacationers, northern Idaho hosts more than 2 million visitors every year. As a result, the area has extensive accommodations and activities. Vacationers planning a trip to Sandpoint should check out the online Visitor Guide and Lodging page to learn more about the area and where to go.